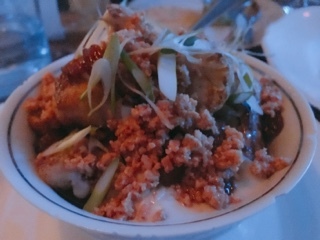 Even as Chantecler completed a transformation in 2016 – their menu evolving from Asian fusion small plates to French traditional mains - its popularity hasn’t waned; a dinner weekend visit was just as busy as two year’s prior. In terms of décor, little has changed: the dining room is still cozy and dimly lit, the vintage stove still going strong. Their gougères ($5) have taken a dive – the puffs need to be warmer and incorporate more cheese. Whereas previously it had a molten centre, the innards for these is like a buttery bite of brioche, hardly the bite-sized treat I was expecting. With the first taste of the soft almost mushy steak tartare ($12), I was on the fence. But, once it was scooped onto the crunchy crostini and the hits of chopped gherkins came through, there was enough texture to balance out the meat. 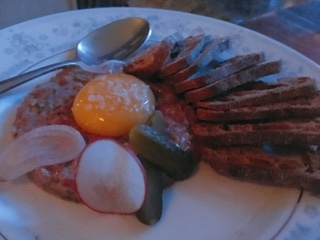 Incorporating tons of spices and a large raw egg yolk, the tartare is rich. With its hefty portion, this starter is made for sharing. 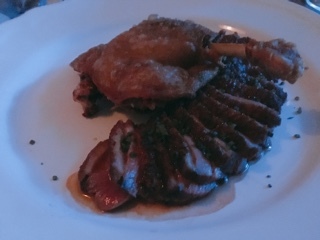 The half duck with crepes ($32) arrived with a pan seared duck breast and salty confit leg. Both were cooked wonderfully, the skin extremely crispy and well rendered while the meat remaining juicy and tender. If only the chive crepes weren’t ice cold the dish would be excellent. 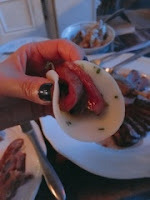 When wrapping the duck, having your first taste be a chilly foamy shell isn’t appetizing. 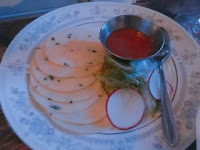 Really Chantecler, if you’re not going to at least re-heat the crepes … just leave them out. 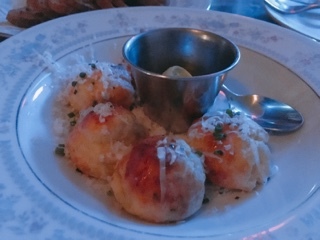 Their roasted cauliflower ($6) is made for people who normally don’t eat vegetables. Slathered in a creamy cheese sauce and topped with chopped almonds for crunch, the side could easily stand in for mac ‘n’ cheese. Surprisingly, Chantecler has a boring dessert menu consisting of two choices that really don’t elicit excitement. What a disappointment given there are so many French pastries to choose from and we saved room for a sweet ending. Nonetheless, what they lack in choice, they compensate by executing the two options very well. The custard in the lemon parfait ($8) was luscious and smooth, its tartness balanced by the cookie crumble and vanilla whipped cream. You don’t get that hit at the back of your throat that makes you squint, instead after a taste I instantly wanted another spoonful. Despite not being a fan of flourless chocolate torte ($12), Chantecler’s was delicious. 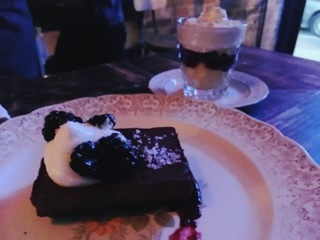 The espresso cream added interest against the rich smooth ganache and the blackberry with cassis (a red current liqueur) lightening the dessert a bit. 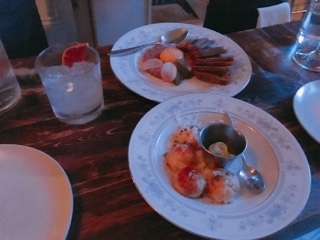 Chantecler’s laid back vibe makes the restaurant ideal for catching up with friends (although a small group suggested as the loud music makes it impossible to speak to more than four). You can even dine alone, grabbing a seat along the bar. Their open concept kitchen will keep you entertained or have you wondering if you should swap out the stainless steel gas range for a cute old-fashioned electric stove instead.